You don't have to wait for a holiday or special occasion to bake this scrumptious skillet snickerdoodle cookie. The big skillet cookie has all the flavor and texture we love about yummy, cinnamon-coated snickerdoodles, and there are all kinds of serving options. An iron skillet is the ideal baking pan for this cookie. The name "snickerdoodle" is thought by some to be German in origin. According to Joy of Cooking, the word probably comes from the German schnecken nudle, which means snail noodles. Others claim it's a whimsical name that probably originated in early New England. Your friends and family will love this giant snickerdoodle cookie. Slice it into thin wedges for cookie portions or slice it into larger wedges and top with a scoop of ice cream and a drizzling of caramel sauce. The possibilities are endless! See the serving suggestions for more. In a bowl, combine the flour, cornstarch, baking powder, and salt, if using. Stir with a whisk or spoon to blend the flour mixture thoroughly. In a mixing bowl with an electric mixer, beat the softened butter with the 1 1/2 cups of granulated sugar for about 4 minutes, or until light and fluffy. Beat the eggs and vanilla into the creamed mixture. Slowly stir the flour mixture into the wet ingredients until well blended. Lay a sheet of plastic wrap across a 10-inch skillet, leaving long ends. Pat the cookie dough in the plastic-lined skillet and then cover with the ends of the plastic wrap. Refrigerate for about 30 minutes. In a small bowl, combine the egg white with the 1 tablespoon of water and whisk to blend. Set aside. In another small bowl, combine the 3 tablespoons of granulated sugar with 1 1/2 teaspoons of ground cinnamon. Set aside. Lift the cookie dough out of the skillet. Butter the skillet bottom and sides of the skillet. 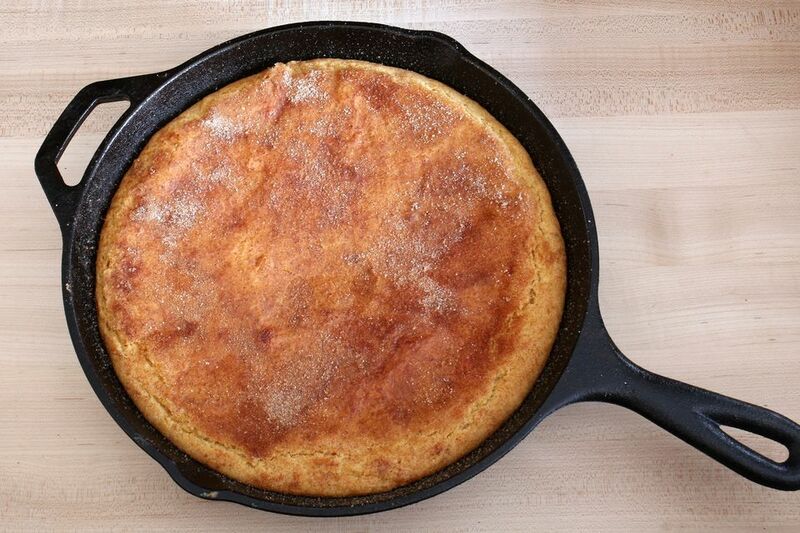 Sprinkle about 1 to 1 1/2 teaspoons of the cinnamon sugar mixture over the bottom of the buttered skillet. Invert the big disk of cookie dough and place it in the skillet. Peel off the plastic wrap. Brush the egg white mixture lightly over the cookie dough and sprinkle evenly with the remaining cinnamon sugar mixture. Bake for 40 to 45 minutes, or until the cookie is browned and set. Slice into wedges and enjoy slightly warm or completely cooled. Store in an airtight container or freeze portions. *If desired, use 2 teaspoons of cream of tartar and 1 teaspoon of baking soda to replace the baking powder. This combination is frequently used in traditional snickerdoodle cookie recipes. The recipe makes about 2 1/2 to 3 dozen thin wedges or about 10 to 12 larger wedges. Wedges of snickerdoodle cookie make a fabulous dessert with fried apples, a scoop of vanilla ice cream, and pecan sauce or a caramel sauce. Add 1 cup of white chocolate chips or butterscotch chips to the batter. Use snickerdoodle cookie crumbs to top ice cream or layer in parfaits. Serve a small wedge along with this snickerdoodle creme brulee.